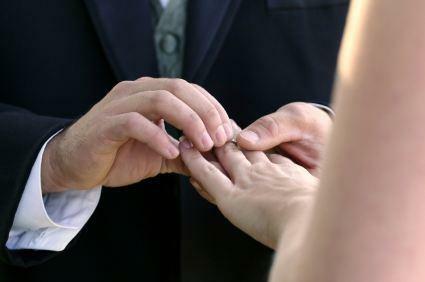 Learn about other kinds of wedding rings. If you're looking for a classic wedding band design, you might consider the Cartier Trinity ring. This beautiful designer ring style is perfect for wedding jewelry or as an anniversary band. Founded in France in the mid-1800s, the Cartier jewelry company has had a long history of manufacturing and marketing high-quality watches and designer jewelry throughout the world. Over the years, many celebrities have worn Cartier jewelry and engagement rings, and today, the brand is associated with luxury and good taste. Throughout its long history, Cartier has unveiled several popular jewelry collections, but Trinity de Cartier or "Cartier Trinity" is one of the longest-running and most popular. First created in 1924, the Cartier Trinity collection features three interlocking bands of white, yellow, and rose gold. The white gold band symbolizes enduring friendship. 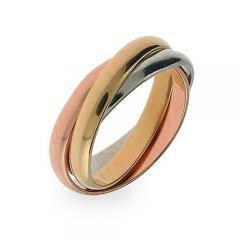 The yellow gold band is said to represent the loyalty or fidelity of marriage. The rose gold band stands for true love. Over time, Cartier has incorporated various changes into the traditional Trinity ring design. Diamonds sometimes accent the original three bands. Plain trinity ring engraved with "Cartier"
Since Cartier has carried the Trinity line for more than 85 years, you may be able to find beautiful vintage wedding rings in this design. Vintage or estate Trinity rings are often ore affordable than new Cartier rings, and you can likely find one for a few hundred dollars. Genuine Trinity rings are stamped with "Cartier." Trinity rings are always 18K gold. Look for rings stamped "750." A pre-owned ring may show evidence of previous wear, but your jeweler can likely polish it to remove this. Be sure to have the ring independently appraised. It may be more expensive to have a Trinity ring resized to fit your finger. If you're interested in buying a new Cartier trinity ring, you'll need to shop at a Cartier-authorized jeweler or buy directly from the Cartier website. While you'll get the best selection by shopping on the website, you may find shopping at a Cartier boutique is a better idea. If you shop in person, you can try on the various styles of Trinity rings to determine which one looks best on your hand. You can also have you finger professionally sized by a Cartier jeweler to be sure your ring fits properly. You may also see new Cartier rings on online auction sites. There's a good chance these rings are imitations of the real Cartier designs, but they may be a good option if you're on a budget. As with any online jewelry purchase, be sure to have the ring independently appraised when you receive it. Regardless of whether you select a new or vintage Trinity ring or an imitation of this popular design, you're sure to have a wedding band you'll love for years to come.